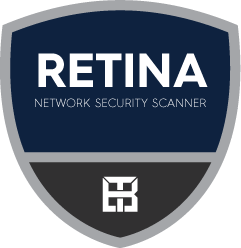 Retina Network Security Scanner, recognized as the industry standard for vulnerability assessment, identifies known network and zero-day vulnerabilities and assists in prioritizing threats for remediation. Featuring fast, accurate, and non-intrusive scanning, users are able to secure their networks against even the most recently discovered vulnerabilities. The Retina Scanner provides security risk assessment, as well as enables security best practices, policy enforcement, and regulatory audits. Note: US Government customers will not receive IAVA or STIG updates with this version of Retina Network Security Scanner. Please contact federalsales@beyondtrust.com for correct pricing and ordering toward this requirement. This agreement is a one year subscription of Retina Network Security Scanner and the product will not function after the subscription period has ended. Each Retina Network license is a one year subscription supporting unlimited IP addresses and may only be installed on one machine. If you are a consultant who wants to use Retina to scan more than one organization, please contact BeyondTrust Sales for information about Retina Consulting Licenses. Product maintenance and Standard Support is included with every Retina subscription. Product Maintenance provides licensed users with version updates as well as continual access to the latest vulnerability audits available through the Auto Update feature of Retina. Technical support includes 24/7 phone and email support, as well as access to the BeyondTrust Customer Portal. Please note that it may take up to 48 hours to receive your Customer Center login credentials. All other PowerBroker Privileged Access Management and Retina Vulnerability Management solutions can be purchased directly through your BeyondTrust account executive. Please click the Contact button below and tell us about your requirements. A representative will then call you to discuss next steps. Copyright © 1999 — 2019 BeyondTrust, inc. All rights reserved.